In this post you will discover all the facts, causes, symptoms and (DVT) Deep Vein Thrombosis treatment in the light of homeopathy. Deep Vein Thrombosis (DVT) is a chronic and painful disease. Now days many people especially women are becoming victim of this fatal disease. Its curing medicine could not discover at yet in modern allopathic method of treatment. Usually allopath doctors suggest low molecular weight heparin (anticoagulant) medicines for the patients and patient gets only temporary relief from it. Sometimes the blood of patient become too thin with the use of those medicines and there starts bleeding from nose, mouth or anywhere from the body and it becomes more chronic situation. 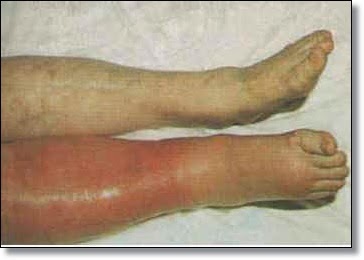 In this disease patient’s blood becomes thick and there develop blood clots in one or both of legs, therefore this disease is given the name of venous thromboembolism. There becomes hindrance in the supply of blood and the patient becomes a victim of painful torment. Legs become swelled and there starts a constant pain. Legs arteries get swelled and skin become sensitive, sometimes even a minute touch cannot bearable. Red, bluish and black spots and bruises might be appearing on legs. Sometimes the patient feels pain in the chest and also feels difficulty in breathing. Patient cannot walk even a few steps. Causes of venous thromboembolism DVT! Mostly this disease is found in non –O blood type of people but found in other blood groups also. It might be occur in women during pregnancy or after pregnancy. A major surgery of leg or internal bleeding can be also a cause of DVT. The bad effects of the hormonal medicines, heparin drugs or chemotherapy can also gave birth to DVT disorder. Any auto immune disease or chronic swelling of kidneys can be also the cause of DVT. Today’s spicy diet, fast foods, fizzy drinks and chemically preserved packed foods or juices becoming the major cause of DVT. Obesity and lazy living without any exercises can also give birth to venous thromboembolism prophylaxis. Homeopathy treatment for Deep Vein Thrombosis! In homeopathic repertory mention these remedies, Arnica, Bothrops Lanceolatus, hamamelis virginiana, Lachesis, etc for this disease but it is very important that observe patient instead of disease and suggest most likely remedy according to the symptoms. In my personal experience Stannum Metallicum and Bellis Perennis are giving miraculous results for this disease. A few days back I went to see a patient whose left leg was becoming double due to swelling and she cannot walk even a single step. I recommended Arnica and Bothrops in the light of repertory to dissolve blood clots in the vein but the patient got only a minor relieve. When I keenly observe the patient, I notices she was sit by bending her effected leg, even though she was unable to walk or move. On my asking, she told me that she felt relieve in pain by bending her leg. It is the pet symptom of Stannum, therefore, I gave single dose of Stannum 200 to her and the next day the swelling of the patient leg almost finished and she get busy in her household activities once again. Besides this the second most worthy remedy for DVT that come under my observation is Bellis Perennis. During or after pregnancy, if someone becomes victim of DVT you can give Bellis Perennis mother tincture or 3X with full confidence and your patient will recover to normal in a miraculous way. This remedy also works perfectly in old age people. Important instructions about DVT prevention! If the pain is unbearable then use special kind of socks ‘compression stocking’ that are available on medical stores. Eat more vegetables and fruits rich in vitamin K.
Avoid smoking, alcohol and any kind of drug taking. Avoid completely from more salt in taking in daily foods, processed foods, spices, red chilies, junk foods, vinegar, cold drinks and sour fruits for example oranges and citron. Do not eat out seasoned fruits or vegetables. Take light exercises and walk as much as you can. The patient should avoid to sit by hanging legs and also do not stand for long time. If women become victim of DVT after pregnancy, then mother must feed her baby compulsory. The chances of breast cancer in mother increase in the situation of not feeding. Usually the women suffering from DVT have lack of feeding ability to their infants. This problem could be solved by giving Agnus Castus mother tincture to the mother. Homeopathic remedies for DVT with key symptoms! If the patient gets relief by bending one leg (it could be affected or non affected leg) then Stannum Metallicum will be the final remedy. The remedy for DVT during or after pregnancy is Bellis Perennis. Use Crataegus and Cactus in mother tincture if the patient has high blood pressure complaints. If the patient tongue is trembling then use the single dose of Lachesis in a high potency. If you discover a heave use of vinegar and sour foods in patient’s history then Aceticum Acidum will work fine. If the patient feel irritation in legs with cold outside and heat sensation inside then the medicine is Secale Cornutum and Agaricus Muscarius will be use for the vise versa. If the patient is also suffering in Vitamin K deficiency then the bio chemical salt Calcarea Fluorica 6X will work great. Beside the above stated remedies, Bothrops, Hamamelis, Collon Sonia, Sulphuric Acid, Natrum Mur, Pulsatilla and Sulfur are also the useful remedies and use can use any according to the symptoms. Note: Use an interconnect remedy according to the patient’s constitution, so that the disease could not return.